DTT: A Muslim mother waiting to pick up her kids from a private school was attacked today in London. According to the victim, she states that she was waiting to pick her kids up when few women came up and asked her if she feels hot wearing the ‘Hijab’ (head-scarf). While replying back to their question, one of the girls pulled the Hijab off her head and punches were thrown at her face. The victim who wants to stay anonymous said that she was repeatedly punched and kicked in the face. The attackers also hurled many derogatory and ‘racist’ comments when they were beating her. The victim mentioned that they stopped when a woman intervened. She was going to collect her two young children on Thursday when a number of women started “shouting and hurling abuse”. 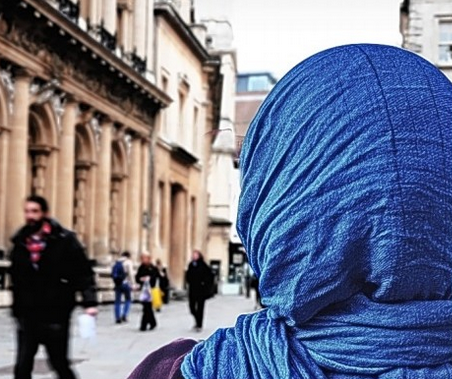 They allegedly asked if she was hot in the headscarf – before yanking it off and punching her. The mother, who wished to remain anonymous, told the Standard: “They pulled my headscarf off and started punching and kicking me. “One was dragging my head down while the others were hitting me.